I have to confess to being a fan of Colum McCann’s writing. When I read his 2009 novel Let the Great World Spin, I raved about it for months afterwards, so needless to say I was very excited to receive his latest offering, TransAtlantic. McCann was born in Dublin but now resides in New York, and the Irish-American connection has been a recurring theme in his work. As the title suggests, this is again the case with TransAtlantic. Similarly to Let the Great World Spin, McCann sets his fiction against historical events to deliver a book that is immediately absorbing. The opening chapters are seemingly unrelated and could almost be considered a collection of short stories. However, it soon becomes clear that what McCann is doing is delivering a series of snapshots of characters and the moments of history that they find themselves in. It is a saga that spans three generations of women and covers the Irish potato famine in 1845, the American Civil War, the Troubles in Northern Ireland and the first non-stop flight across the Atlantic in 1919, as well as the present day. McCann’s writing is so wonderfully descriptive that it’s not difficult to be transported to another era or to share the experiences of his characters. His account of the flight across the Atlantic, for instance, had me nervous for the two aviators; I could almost feel the icy air that made ‘the bones in their ears ring’. 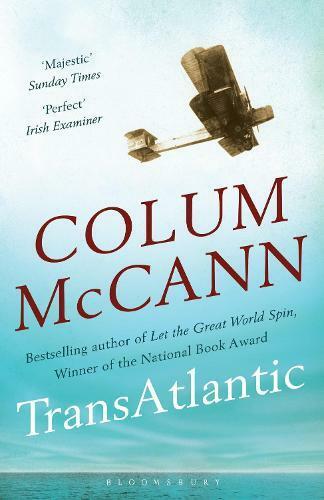 Not only did I enjoy TransAtlantic as a work of fiction, but I enjoyed it as a work of history as well. A great book to curl up with in front of the fire on a cold winter’s day.